Learn more about PFF's unique NFL Player Grades, including how they are calculated and why some players rank higher than others despite similar game statistics. Player Grades puts you at the heart of the PFF World. During the NFL season, our team of 300-plus staff spend around 20,000 man-hours of work to grade and analyze every play of the NFL season, from the kickoff in the Hall of Fame game to the final play of the Super Bowl. Memories can deceive, and highlights by their nature miss out on the vast majority of a player’s game, but PFF covers every player on every play of every game to give you the most comprehensive analysis of player performance you can find anywhere. Because of this, sometimes the grades will show unexpected results. Just because a player isn’t a household name, doesn’t mean he isn’t capable of having an excellent game, or even having an excellent season that is just passing by the notice of most people. In fact, one of the benefits of PFF’s comprehensive grading system is being able to get out in front of talented players on the rise, and spot players performing well before the rest of the NFL watching world catches up to them. PFF was among the first touting the play of Cameron Wake when he was earning scant playing time behind Joey Porter, and we were out front in championing the elite coverage play of Richard Sherman during his rookie season. Before diving into the results of the system, let’s take a look at how it works. On every play, a PFF analyst will grade each player on a scale of -2 to +2 according to what he did on the play. At one end of the scale you have a catastrophic game-ending interception or pick-six from a quarterback, and at the other a perfect deep bomb into a tight window in a critical game situation, with the middle of that scale being 0-graded, or ‘expected’ plays that are neither positive nor negative. Each game is also graded by a second PFF analyst independent of the first, and those grades are compared by a third, Senior Analyst, who rules on any differences between the two. These grades are verified by the Pro Coach Network, a group of former and current NFL coaches with over 700 combined years of NFL coaching experience, to get them as accurate as they can be. From there, the grades are normalized to better account for game situation; this ranges from where a player lined up to the dropback depth of the quarterback or the length of time he had the ball in his hand and everything in between. They are finally converted to a 0-100 scale and appear in our Player Grades tool. Season-level grades aren’t simply an average of every game-grade a player compiles over a season, but rather factor in the duration at which a player performed at that level. Achieving a grade of 90.0 in a game once is impressive, doing it 16 times in a row is more impressive. It is entirely possible that a player will have a season grade higher than any individual single-game grade he achieved, because playing well for an extended period of time is harder to do than for a short period. Similarly, playing badly for a long time is a greater problem than playing badly once, so the grade can also be compounded negatively. Each week, grades are subject to change while we run through our extensive review process including All-22 tape runs and coaching audit, so you may notice discrepancies among grades published in earlier articles compared with those in the Player Grades tool until grade lock each week. 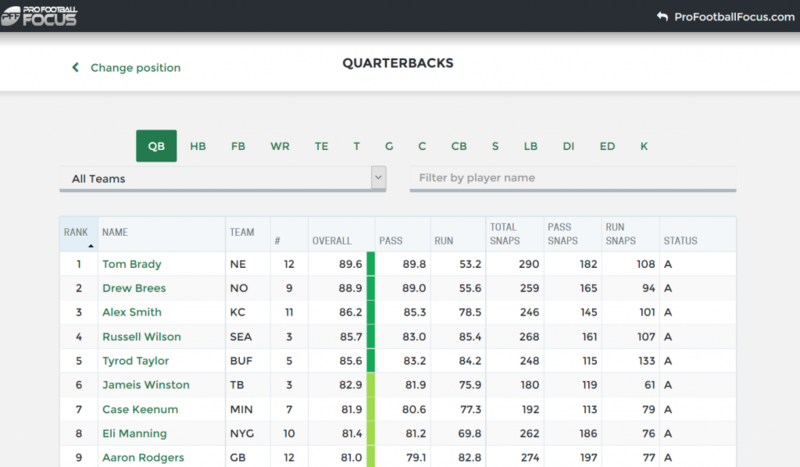 PFF EDGE gives you access to the most popular Player Grades features, and much more. Grades for each facet of a player’s game (receiving, run blocking, coverage etc.) on a 0-100 scale. Head to head matchup charts featuring multiple offensive and defensive formations. Full grades for each player in the NFL by team roster and position. The first thing everybody wants to do when you have graded players is to see where they rank against each other. Player grades gives you the ability to rank players by position and even by facet of the game. Want to see who the best pass-blocking tackles this season are? No problem. Or the best run defending linebackers? Player Grades has you covered. The grades pages allow you to rank players by position, but also filter by teams, to compare the grades of just one team’s cornerbacks, for example. We also combine defensive fronts and group players as either edge defenders, or interior defenders, to save confusion between 4-3 and 3-4 defensive fronts that in today’s NFL are often in exactly the same alignment by defensive techniques, just from either a two- or three-point stance. It’s important to understand that PFF is not grading talent in these numbers, rather strictly performance on the field. Talented players can have bad games, runs, or even seasons, and often players without nearly as much talent can put together impressive play on the field. We are not necessarily telling you who the best players are. Our rankings are more of a performance evaluation, and a reflection of how efficiently a player made plays in the time he was on the field. Another key benefit to PFF’s grading system is building a complete picture of a player’s performance. Even watching a game closely can result in something of a mental highlight reel on a player – remembering the few good and bad plays and making an overall judgement based on the balance of those – but it can be the other 40 snaps in the game that are being ignored that held the true key to his performance. Was he gaining a slight edge every one of those snaps, or was he struggling just to maintain parity? By recording performance on every single snap, we come to a more complete conclusion and evaluation. Just because a player was quiet during the game does not mean he played poorly, and in certain positions it could mean he played very well, but had little to feature on the highlight reel. Beasley sacked the quarterback 16 times, but eight of those sixteen were either unblocked or clean-up sacks that owed more to somebody else flushing the quarterback towards where Beasley was than they did to him beating a blocker to make the play.PFF grading takes into account the quality of the play made to get the sack, and excellent plays to defeat blocks will be graded higher than sacks where the quarterback just happened to be flushed past a player as he was being blocked only to get taken down. All pass-rushers are trying to sack the quarterback, but even the best will only do so on around three percent of their snaps on the field. Hits and hurries combine with sacks to form a much more robust picture of total pressure generated. Pressure that does not result in a sack is important too, as just pressuring the quarterback sees an average drop in passer rating of 32.0 points from 94.4 to 61.8 over the past ten years. That’s the equivalent of turning Ben Roethlisberger into Blaine Gabbert just by hurrying him in the pocket. Beasley led the league in sacks, but was just 18th even among edge defenders, when it comes to total pressures. Compare that to a player like Oakland’s Khalil Mack who led the league with 96 combined sacks, hits and hurries, and Beasley has a significant deficit in total pressure. When we used our analytics to run numbers to find out just how valuable pressure was compared to sacks, our Expected Points Added data showed that a sack is worth around 2.1 pressures of any other kind. So a player like Mack would only need to have had an extra 11 hits or hurries to have added more value as a pass-rusher than Beasley despite having five fewer sacks over the season. 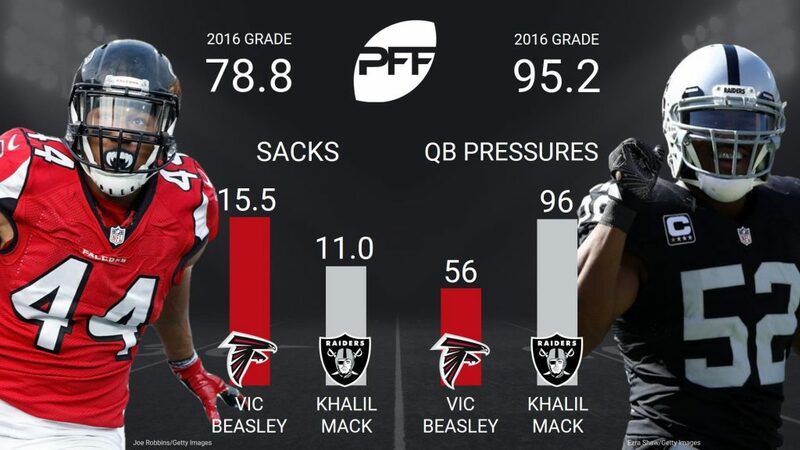 Mack in reality had 40 more pressures, and so had a significantly higher PFF grade than Beasley. Mack’s overall grade of 95.2 was also far higher than Beasley’s 74.2 because Khalil Mack was one of the best run defenders in the game, capable of shedding blocks and knifing into the backfield to blow up plays. Beasley wasn’t nearly as accomplished in this area, an area that can get lost in all the talk of sacks, but is counted in the PFF grading. We aren’t grading players based on the yardage they rack up or the stats they collect. Statistics can be indicative of performance but don’t tell the whole story and can often lie badly. Quarterbacks can throw the ball straight to defenders but if the ball is dropped, you won't see it on the stat sheet. Conversely, they can dump the ball off on a sequence of screen passes and end up with a gaudy looking stat line if those skill position players do enough work after the catch. PFF grades the play, not its result, so the quarterback that throws the ball to defenders will be downgraded whether the defender catches the ball to notch the interception on the stat sheet or not. No amount of broken tackles and yards after the catch from a bubble screen will earn a quarterback a better grade, even though his passing stats may be getting padded. The same is true for most positions. Statistics – as we saw with Beasley earlier – can be misleading. A tackle whose quarterback gets the ball out of his hands quicker than anybody else may not give up many sacks, but he can still be beaten often and earn a poor grade. Receivers that are targeted relentlessly could post big time numbers, but may offer little more than the product of a volume-based aerial attack. The Player Grades tool also offers you a quick glance way to see team matchups and starting lineups. These offer the flexibility to see teams aligned in both base defense and their common sub packages, and likewise cycle through an offense’s most common personnel groups. 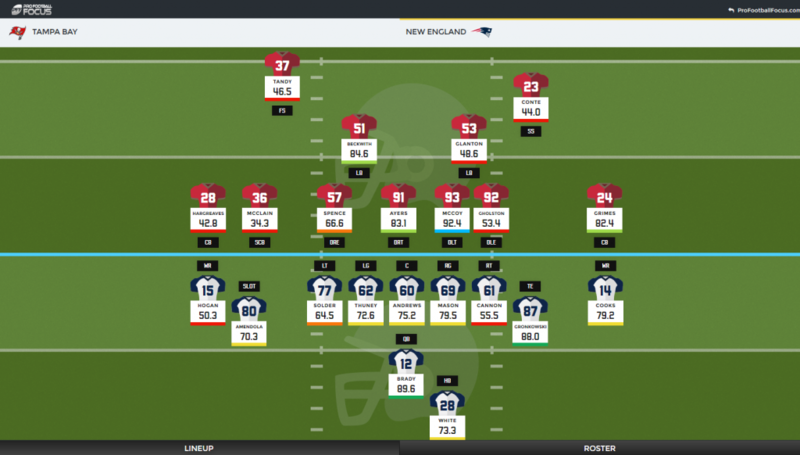 Players are shown with their current player grade and color-coded for an easy way to see potential strengths and weaknesses across an upcoming matchup. Each week’s games are automatically shown as matchups on the home page, but you can also create a custom matchup of any two teams if you want to look ahead and scout potential playoff opponents! The Player Grades tool shows a rolling season-level grade rather than individual game grades. Fans who want to dig into player grades at the game level, and access all PFF Signature Stats, will want to sign up for PFF Elite to unlock our Premium Stats database. 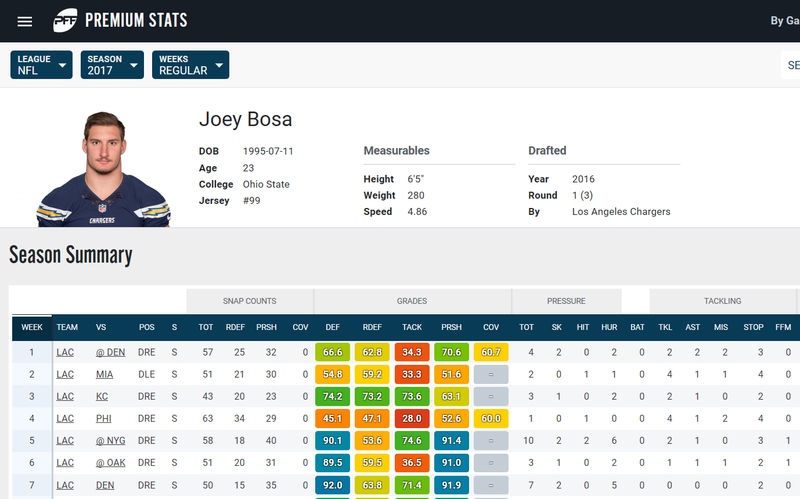 Premium Stats includes 0-100 grades for teams and players by week. PFF Signature Stats by position and week. Pre-snap position tables show how often a player lined up at each position per game. Historical game grades and performance data, including the playoffs, back to 2008. PFF Greenline game projections and much more. Begin your journey into PFF Player Grades today. Choose the subscription that suits you here.